On March 13, 2013 I wrote about the genesis of this project, which started with a map of all of the Search and Rescue teams in British Columbia, and has expanded to all of the teams in Canada. The current iteration of the map is above. The map started with some work I was doing for the BC Search and Rescue Association (you can look at the finished map there). 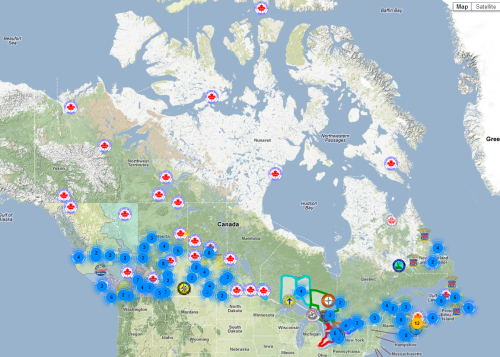 I decided to expand on the initial work by including SAR teams from the rest of Canada. If you’d like to include your team, or to update the information I already have, you can use this form. From time to time I take the information submitted and update the map with logos. Sometimes I add new features. National agencies should have their own listing (currently buried on the map). I started this small project just to see if it could be done, but the process has taught me one thing; how proud I am to be one small part of such a huge group of volunteers dedicated to the safety of others. Seeing this map gives a good picture of the many people who spend their spare time rescuing others in the country. This map is for you, the volunteers.